Now, we start a new circuit. The LED is a standard component. 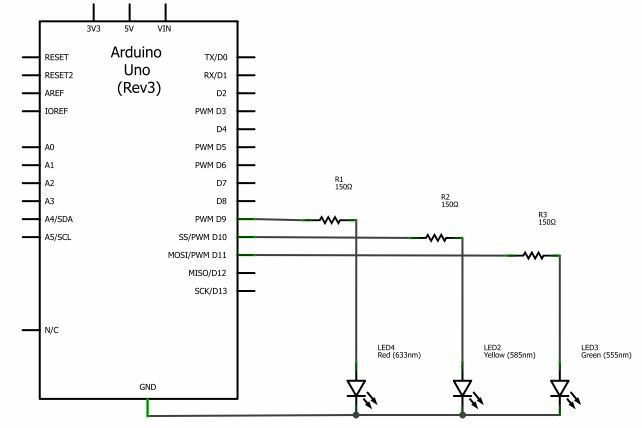 We use LEDs with 2V and a maximum current of 20 mA. Please, look tutorial 1.0 or 1.1 how to calculate the resistor. It’s the seem. 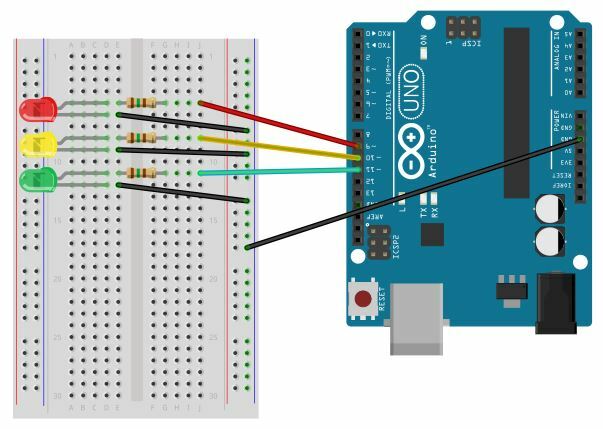 In this tutorial, we use three pins – pin 9 to control the red LED, pin 10 to control the yellow LED and pin 11 to control the green LED. First, we define our variables. We define the direction – we use all three pins as output pins. And, the first time, we set a default value. I think, the code is easy and you will understand it without long explanations. You can adjust the breaks between the phases. STOPP! Don’t destroy this circuit, this is the basic for the next circuit!